Designing a nursery is one of the many exciting pieces of the “waiting for baby” puzzle. As you begin to plan for your new baby’s space, consider some of these nursery room ideas to give you a head start on designing and decorating. Designing a nursery is exciting! As you begin to plan for your new baby’s space, consider some of these nursery room ideas to give you a head start on designing and decorating. 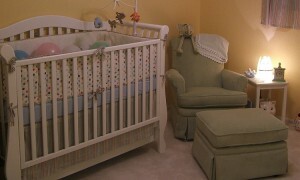 Choosing a room that will become your nursery may be an obvious choice or an agonizing decision. Whether you have a few spare rooms to choose from in your DFW home or are struggling to create a space in your already cramped place, use these tips to figure out where to plan your nursery. Heating, Air and Ventilation: New babies are especially susceptible to heat and cold. Evaluate spaces in your home to ensure you choose one that can be maintained at a proper temperature. Easily Accessible: Accessibility is key for you now and baby later. In homes with bedrooms on different levels, accessibility can be a key decision factor — are you going to go up or down stairs every trip to the nursery? Could you choose a space on the same level as your room while your child is an infant and move them to a bedroom on another floor as they grow older? Privacy: If you have additional people living with you in your home, remember that baby will need to have private, quiet space to accommodate falling (and staying) asleep and distraction-less feedings. You’ll also want a place that can keep a majority of your baby gear self-contained. Lighting: Whether flooded with natural sunlight or aided by overhead or standing lamps, having a nursery with lots of lighting is important. Once you’ve picked a space, your next step is to choose the main color for your nursery room. This color can influence furniture picks, wall hangings, and matching accessories. Don’t feel like you have to follow conventional color schemes (e.g., pinks and blues). Instead, think about what colors you already love and what overall theme you want to create. Try out some of these potential nursery room ideas for your color palette. Deep hues: For a twist on conventional colors, consider using a deep blue, hot pink, vibrant green, or sunny and bright yellow for the walls. Rich earth tones: Use a rich golden tan color, a smooth chocolate brown, or a forest green shade for an earthy palette. Complementary color: If you’ve already chosen a character or theme to build your nursery around, pick a complementary colors associated with that theme to be your main wall tone. Last (but certainly not least) is filling your nursery with furniture for the baby — and for you! Here’s a list of must-haves for your new baby space. Crib: When it comes to the crib, you have two major choices to make: Would you prefer a crib that will simply and only be a crib, or one that convert into a bed as your child grows older? Changing table: You’ll use this item almost a dozen times a day as your little one goes through diaper after diaper. If your space is limited, consider using a changing pad on top of a dresser instead. Rocking chair: This piece is as much for you as baby. Between rocking to sleep, sitting while nursing, and catching a few winks while baby dozes, you’ll want to make sure your rocking chair is comfortable. Consider chairs that come with a separate rocking ottoman or that can recline. You’ve got a space, know your color palette, and have a head start on choosing furniture. Congrats! All of your basic nursery room ideas are covered.